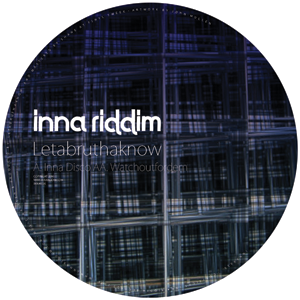 Letabruthaknow announces his arrival to the Inna Riddim family with a calling card that’s equally sophisticated on each side. The first of two choice juke/footworks cuts, ‘Inna Disco’ is as smooth and rich as an espresso martini, softening the staccato kick-drum pattern with an embrace of shimmering pads and sensuous chimes, offset by a hint of junglist snare and all wrapped up in a warm and enveloping sub. Equally suited to the bedroom as the discotheque. ‘Watchoutfordem’ takes a different approach, building from a tenaciously oscillating detuned bassline and snapping backbeat into a rhythmically complex tune that counterposes colourful synth arpeggios with dubwise samples and darkly sinuous modulations. Stepping riddim for discerning heads.